truck or trailer closer to deck-level. Ramp Height = Dock Height + 2" minus Truck Bed Height =________________. Ramp selection is based on the following three items. A-Width: Based on the maximum wheel width of your largest vehicle. 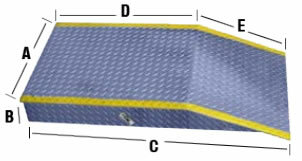 For double wheel vehicles, choose the 24"
width and use the ramp at the inside wheel location. B-Height: Determined by the following formula - Dock Height plus 2" minus Truck Bed Height =________________. Choose the next highest standard height in chart. complete source for material handling equipment.